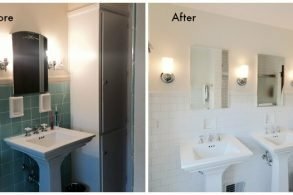 After living in their home with a carpeted master bath and overall outdated design, ACo clients Remington and Sarah Ramsey were ready for a renovation. Without a completely clear vision, the Ramsey Family visited ACo’s Carmel showroom and knew they wanted a big change with a “Blue Ribbon” design for their master bathroom. “All the best bath designs had a Blue Ribbon, and I wasn’t sure what we were going to do in our bath, but we were going to gut it and at the end, I wanted a Blue Ribbon,” Remington says. ACo design professional, Dani Kohl, stepped in to listen and deliver their needs and desires for a complete and updated master bathroom plan. 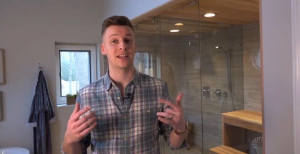 “When I originally thought about putting a sauna in our bathroom, I just thought about the saunas you see at the home shows and wondered how could we have a stand-alone sauna in our bathroom without taking up too much of the space?” Remington says. Kohl’s design gave the clients exactly what they had asked for. “Once it was complete, even down to the detail of white paint, the design changed the entire space and it’s beyond everything we wanted and more,” Remington adds. For experienced ACo project manager, Rick Strezishar, it was an exciting project. “The plans looked awesome,” Strezishar says. 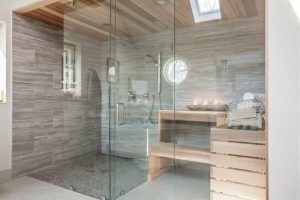 As a kitchen and bath remodeling company, Strezishar has managed many successful project renovations, but the sauna added an uncommon and unique rejuvenating feature for the Ramsey family. Not only did the master bath include a fresh take on a tile-glass-combo shower and sauna but also included a relaxing soaking tub and double vanity with massive storage drawers for all their bath needs. Finishing touches such as chrome Delta faucets with a mixture of warm tile and cool cabinet colors brought the aesthetic together nicely. Ready to begin your Blue Ribbon Bathroom? Find out by taking our short but fun Love It Quiz.